Auroville, the largest intentional community home to 2.700 people from 53 nations, just celebrated its 50th birthday with a dawn fire meditation and collection of water from 320 sources globally. 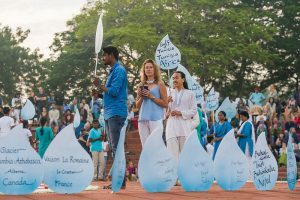 Friends of Auroville visiting for the 50th birthday were called upon to participate and the result was just overwhelming: Water was brought in from all over the globe and even from Hiroshima, Alaska, South Africa, Hawaii, New Caledonia and the Antarctic. In a simple ceremony a young couple carrying one of the waters and a sign, stating the origin of the water, poured it into a golden disc, after passing through an ancient symbol for “rain”. 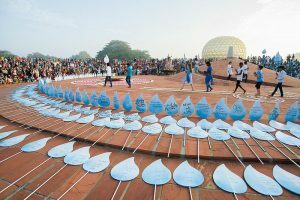 Then all these “water signs” in form of drops were placed all around the center of Auroville’s Amphitheater. 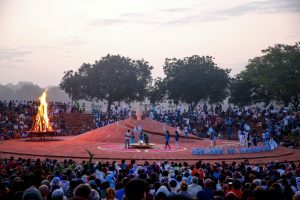 For Auroville’s inauguration in February 1968, attended by 5.000 people and supported by UNESCO, a similar ceremony saw handfuls of earth from 124 Nations and all Indian states being placed in the Urn in the Amphitheater. The water ceremony for its 50th birthday was refreshing this commitment as a global collective attempt aiming at evolution of consciousness and human unity. The water collected in the golden disk, placed at the center of Auroville represents – even vibrates – a joyous global consciousness. Probably this water, this information, this consciousness now re-united after quite a long time… maybe since the creation of planet earth? We have taken a water sample from the golden disc, and are preparing a homeopathic remedy of this reunited water, naming it “Aqua Terra”. It might very well carry a timeless or primordial global consciousness, and certainly is a reminder of Unity, of Oneness. We plan to conduct a homeopathic proving of “Aqua Terra” in the near future.